Spend four days in the depths of the Ecuadorian Amazon learning more about its unique flora and fauna. The area is home to 550 species of tropical birds, 13 species of monkeys and 1000 species of butterflies. Immerse yourself in the rainforest as you explore on foot, by canoe and from treetop towers. The Amazon basin is the most bio-diverse environment in the world, covering two-fifths of South America across the majority of its countries, including Bolivia, Brazil, Colombia, Ecuador, Guyana, Peru and Venezuela. Most of the basin is covered by forest, the largest rainforest in the world. Our lodge for the next two nights is located within this wild environment in the Yasuni National Park, on the banks of the Napo River. Getting to our Amazon lodge is an adventure in itself. After a short flight to Coca, we travel along the Napo River by motorised canoe (approximately 2.5 hours). Then, we have a short walk through flooded forest (the trails are lined with wooden planks) to arrive at our Amazon lodge. During the journey we will get a taste of the Amazon, passing local communities and spotting birds such as herons, egrets and vultures. Late afternoon, we take a short walk on the nearby trails or a canoe ride to spot monkeys, birds, black caiman and local flora - cedar trees, orchids and bromeliads. After breakfast we paddle across the Napo River for approximately 30 minutes to visit a well-frequented parrot clay lick, bringing us face to face with up to 11 species of parrots (including parrotlets and macaws) depending on the season and weather conditions. We end this morning with a visit to the fascinating Interpretation Centre 'Kuri Muyu'. The women of the local indigenous community manage the centre, and it gives us the chance to understand the Quichua culture, crafts, and traditions, which is sadly diminishing across much of Ecuador and survives mainly in small pockets of communities like Napo. After lunch and time to relax at our lodge, we head out to paddle across the river again, towards the Igapo forest. Here, we take a short walk along forest trails to reach the 35-metre high observation tower, where we spend a couple of hours spotting creatures in the jungle canopy including birds, howler monkeys, squirrel monkeys, toucans, parrots and sloths. A motorized canoe takes us back to the lodge. Rising with the sounds of the forest, we head out towards the local 'Mama Cuna' nature trail, where we walk for around 2 hours, primarily concentrating on the forest fauna, including ceiba trees, strangler vines and bamboo cane, as well as many other vines and shrubs endemic to Yasuni. It's an excellent opportunity to learn about the worldview and herbal medicine use of the Quichua culture - the forest literally provides everything that they need, and is an amazing place to see ecotourism in action. In the late afternoon we grab a canoe and paddle down towards the Anagu lake, where night caimans and other evening creatures await us. Here, the sounds of the jungle really come out as the sun sets and night takes over. Watch out for the red eyes in the darkness! After around 2 hours on the lake, we go back to the lodge in motorised canoes for our evening meal. This morning we rise just after dawn for our final morning here in the Yasuni National Park. The ancient customs surrounding the Guayusa plant have survived for many years among these people, and this morning we use the Guayusa leaves to make a morning tea. Traditionally the Jivaro people leaving in this area rise early, make a fire, boil the leaves and drink the tea while telling stories, myths and dreams, and we will have the opportunity to ask the community to interpret the meanings of our dreams. After this stimulating morning, we head back to the lodge for breakfast before leaving the forest for good, heading back to Coca and then flying to Quito. Daytime clothing should be lightweight and loose fitting, warmer clothing may be needed for the evenings and the canoe ride from Coca to the lodge. Long-sleeved lightweight clothes and trousers plus long socks are useful for protection against sunburn and insects. Bring a swimsuit, sunhat and sunglasses. Lightweight waterproofs are essential. Comfortable walking boots or shoes and trainers or sandals with a good grip. Rubber boots are provided at the lodge. One main piece of luggage, plus a daypack. Remember, you are expected to carry your own luggage - don't overload yourself. Bring a torch, water bottle, insect repellent, high factor sunscreen, ear plugs and binoculars. You may also wish to bring zip-lock bags to protect your camera equipment. The lodge provides rain ponchos and umbrellas. In this area, tipping is a recognised part of life. Some local staff will still look to members of the group for personal recognition of particular services provided. 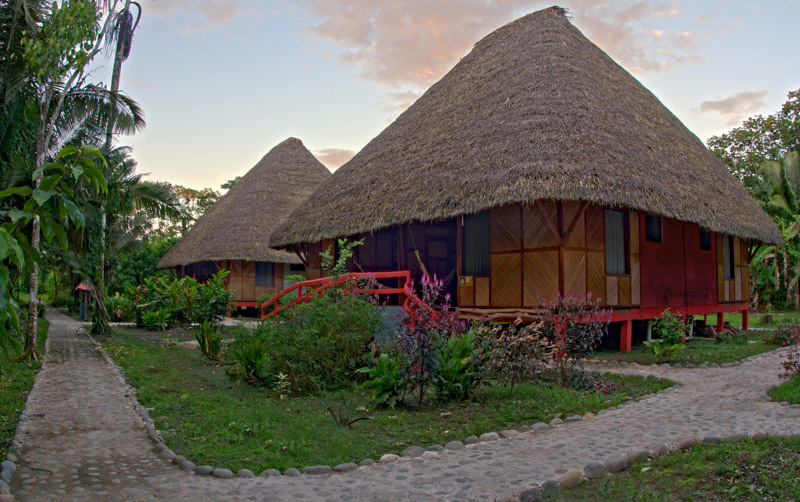 The Napo Cultural Centre is a community-run lodge within the remote area of the Yasuni National Park. The profits from the lodge go to the local Quichua community, from which the staff and guides also come to work. The accommodation itself is made up of a set of cabins, each with private bathrooms, as well as a balcony with views over the lake and the jungle surroundings. Mosquito nets are included, and there is a social area in the main hall where visitors and staff meet, dine and share experiences during their stay. There is also a library stocking bookings on biology, conservation, local birds and natural history etc, to enhance your stay. Please note we require a photocopy of your passport 2 month pre departure. Ecuador: Visas are not required by UK, Australian, New Zealand, US and Canadian citizens. In order for your visa to be granted on arrival, you will be required to show proof of travel insurance valid for the duration of your trip. Please also ensure your passport is stamped with the T3 permit (for 30 or 90 days) on arrival in Ecuador. Other nationalities should consult the relevant consulate. On this tour we use the Napo Cultural Centre, which is a community-run lodge within the remote area of the Yasuni National Park. You'll be staying in a set of cabins, each with private bathrooms, mosquito nets and a balcony with views over the lake and the jungle surroundings. The accommodation itself is made up of a set of cabins, each with private bathrooms, as well as a balcony with views over the lake and the jungle surroundings. There is also a library stocking bookings on biology, conservation, local birds and natural history etc, to enhance your stay. This trip can be combined with a number of South America trips. The Galapagos and the Amazon make a particularly good combination for those interested in nature and wildlife. This extension can operate daily, except Sundays, and will operate with any number of passengers. Information Although our ending time says 14.00 at Quito Airport, flight times from Coca to Quito may change. As with your joining time we will confirm this at approximately 1 month prior to departure.